The Magellan 2200VS scanner is specifically designed for retailers that require high performance ina compact, vertical form factor. Tailored for very small counter retail checkout environments with medium to high volume point-of-sale (POS) transactions, the Magellan 2200VS scanner is particularly effective in drug stores, convenience stores, smaller to medium sized grocery stores, DIY stores,and speciality stores. With category leading scanning performance for superior ergonomics and throughput, the 2200VS demonstrates the Magellan brand renowned quality and reliability. Advanced software decoding algorithms provide the industrys best scanning speed and simultaneously improve first pass read rates of damaged, wrinkled, or poorly printed bar codes delivering improved operational efficiencies at the retail checkout. Flash memory allows for easy software upgrades that help extend the life of the retailers investment.In addition, an auxiliary RS-232 port can be utilized in a variety of ways,including adding a handheld scanner, programming and configuring the scanner,or accessing the scanners label data output. For applications requiring electronic article surveillance (EAS), the 2200VS can be equipped with Checkpoint EAS and can support Sensormatic EAS systems with good read acknowledgement via the auxiliary RS-232 port. Optional Value Added Features provide optional information tools that help decrease front-end costs by managing information on scanner software and diagnostics. 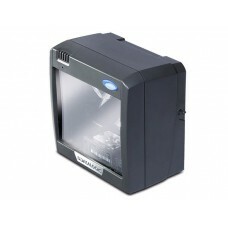 Zebra Symbol LS7808 - USB kit:..
Omnidirectional scanning and a tough, scratch-proo.. Tags: Datalogic MGL2200VS On Counter Barcode Scanner.